This is a selection of books I’ve reviewed at Kindism.org, it is by no means an extensive list of all the books I’ve read/reviewed, only the ones I recommend to friends, fellow former-CS, and ones that are allowed to take up prime bookshelf space. Parenting Beyond Belief is divided into nine chapters, each contains several essays on various topics, with notable contributors including Penn Jillette and Richard Dawkins. There is also a forward, preface, glossary, a list of general additional resources, and biographies of the contributors. There are also more topical resource lists at the end of every chapter. These are incredibly helpful if you’re trying to find books on a more specific topic — holidays, death, science, etc. I would buy it again, and highly recommend it to friends seeking non-religious alternatives. Dennet poses thought provoking questions to the reader and provides brief summaries of what is to come in upcoming chapters. As far as I can tell, Dennett is not arguing that religion is good or bad, he is arguing that region should be studied, questioned and examined. 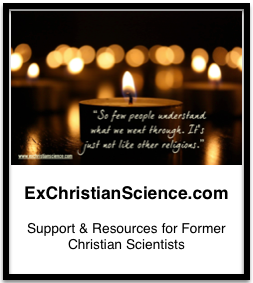 Religions make extraordinary claims, that should be looked at critically, tested, and studied. I happen to agree! The Belief Book is a slim, 74 page paperback, aimed at “readers and thinkers of all ages, including kids and kids at heart.” The nine chapters (including introduction and conclusion) map out the path questions take to becoming religions. The Belief Book is a quick, fun, simple read, that touches on really big ideas. As part of my goals to introduce my children to other religious and mythological traditions in a non-indoctrional way came across In the Beginning. So far I have found it to be a wonderful resource to explore a wide range of creation stories. I highly recommend it for children and grownups of all ages who are curious about other culture’s creation stories, and in learning how our ancestors explored the answers to life’s big questions. If you are only going to read one book about Christian Science, read God’s Perfect Child: Living and Dying in the Christian Science Church . GPC benefits, not only from hindsight, but also from a vast array of resources not available to turn-of-the last century biographers, as a result, it is quite dense, fully footnoted, and I found some sections (the child cases) very difficult to read.